Yokohama is by the sea, separated thirty minutes by train from Tokyo, and has long been a popular travel destination. In this article, we feature things to do and where to visit, from the traditional Sankeien Garden to shopping at Minato Mirai. Yokohama, located just half an hour south of Tokyo, is a big city that is a popular destination with an important history and role in Japan. It is an ideal destination for day trips from Japan's capital. This article explores the best ways to experience Yokohama by introducing the top sightseeing spots, attractions, and dining options that make this city so special. Yokohama, an international port city located in Kanagawa Prefecture, is Japan's second largest city with nearly four million residents. It is roughly thirty minutes south of Tokyo, making it a perfect spot for a day trip away from Japan’s bustling metropolis. Yokohama also has a rich history, containing one of the first harbors in Japan to have opened up to foreign trade after the Edo Era. This has led to the internationalization and prosperity of the city. Yokohama is a popular travel destination because of its ideal location and proximity to the ocean, and offers its visitors unique sightseeing, world-class shopping, and delicious dining options. Yokohama Travel Guide - Discover Minato Mirai and Other Great Areas! Sankeien Garden is a traditional Japanese-style garden known for its seasonal displays of cherry blossoms, azaleas, and autumn leaves. As it is a popular tourist destination, there is multi-language support available to visitors. It is located in central Yokohama and can be accessed via a 15-minute bus ride from the Chinatown and Motomachi areas. Picture from Encounter The World Of Noh At Yokohama's Noh Theater! Yokohama Noh Theater has been in use for over 140 years for Noh, a form of traditional Japanese theater, making it the oldest-remaining Noh theater in the Kanto region. Guests can experience traditional Japanese Noh as well as Kyogen, a comedic performance that is performed the same stage as Noh. In addition to enjoying the performances, the theater's second floor contains rare displays of props and objects used in performances, offering visitors a more fulfilling educational and cultural experience. The Noh Theater is accessible by bus from JR Sakuragicho Station. Encounter The World Of Noh At Yokohama's Noh Theater! Picture from Yokohama Triennale 2017 - An Amazing Art Festival Held Every 3 Years! Located in the scenic Minato Mirai area, the Yokohama Museum of Art is a world-class museum with seven spacious gallery spaces and a variety of art facilities that are used for public workshops and events. The museum was constructed in 1987 and showcases contemporary and modern art from all over the world since the 19th century. The museum is a short and convenient walk from Minato Mirai Station on the Minato Mirai Line. Yokohama Triennale 2017 - An Amazing Art Festival Held Every 3 Years! The neighborhoods of Yamate and Motomachi are historical areas of Yokohama where European foreigners lived in Japan during the Meiji Era. As a result, there are a number of historical residences and buildings featuring beautiful European architecture, giving the neighborhoods a Western-style appearance and atmosphere. The areas also contain parks and lookout spots that provide scenic views of the city and bay of Yokohama. Visitors will also find many shopping and dining options located on Motomachi’s famous shopping street. These areas are accessible from JR Ishikawacho Station or JR Yamate Station. The Seabus is a water transport between Yokohama Port and Yamashita Park. Riding on the Seabus boat allows travelers to feel a refreshing sea breeze while taking in a scenic view of Yokohama from the ocean. Visitors with more time can also choose a harbor cruise with dining options. Yamashita Park is a park right by the ocean that overlooks Yokohama’s ports and the Yokohama Bay Bridge. Frequented by visitors strolling by the water and families relaxing on the grassy lawns, this area provides a relaxing and peaceful respite from the busier areas in Minato Mirai. In the center of the park is a rose garden that blooms in the spring and autumn. Yamashita Park is in a central location, located between destinations in Minato Mirai and the Chinatown and Motomachi neighborhoods. The closest train station to the park is Nihon-Odori Station, located on the Minato Mirai Line. Located close by Yamashita Park, the Osanbashi Yokohama International Passenger Terminal, or Osanbashi, is a prominent boat and ship terminal that offers local cruises around the Yokohama bay as well as longer sea voyages. The terminal itself is artistically constructed, with a spacious deck on the rooftop that offers stunning views of the Yokohama skyline over the water. The Manyo Club is a hot springs facility in the heart of the city. Guests can enjoy natural hot spring water transported from renowned hot springs in Japan, including Yugawara in southern Kanagawa Prefecture and Atami in Shizuoka Prefecture. The convenient location and high quality of the hot spring water at Manyo Club make this a popular destination for visitors and is an ideal spot to relax after a day of sightseeing and walking around in Yokohama. It is easily accessible via Minato Mirai Station on the Minato Mirai Line. Picture from Yokohama - Make The Most Of A Day Spent In Minato Mirai! Yokohama Cosmo World is a popular amusement park offering exciting theme park rides, a game arcade, and other entertainment. The park is perhaps most well-known for its giant Ferris wheel, the Cosmo Clock 21, that is beautifully illuminated every night. This theme park and the surrounding area are full of fun to last all day, making it ideal for a day trip, especially if you are with the family. Admission into the park is free, as visitors only pay for what they want to ride or play. Located in the center of Yokohama in Minato Mirai, accessing Cosmo World is just a short walk from Minato Mirai Station on the Minato Mirai Line. Picture from Yokohama Hakkeijima Sea Paradise: More Than An Aquarium! Hakkeijima Sea Paradise in Yokohama is an aquarium and theme park that allows its visitors to learn about marine life while enjoying thrilling rides. At the aquarium area of the park, guests can get a close-up glimpse at aquatic life, including tropical fish and dolphins. After learning about sea life, the amusement area of the park includes roller coasters and water park rides providing entertainment for visitors who want to experience something more thrilling. Hakkeijima Sea Paradise is located in southern Yokohama and is closest to the Hakkeijima Station via the Seaside Line. Yokohama Hakkejima Sea Paradise: More Than An Aquarium! Picture from Make Your Own Instant Ramen At The Cup Noodle Museum In Yokohama! The Cup Noodle Museum in the Minato Mirai area is an interactive entertainment spot that is a combination of a museum and a factory, dedicated to cup noodles, or instant ramen. In the museum portion of the building, visitors can browse the colorful and interactive exhibits about the history of instant ramen in Japan. There is also a factory where visitors can create their own personal, customizable instant ramen to bring home. The Cup Noodle Museum is accessed most quickly from Minato Mirai Station on the Minato Mirai Line. Make Your Own Instant Ramen At The Cup Noodle Museum In Yokohama! Established in 1859, Yokohama’s Chinatown has a long history and now operates with over 200 restaurants, food stands, and other establishments offering flavorful and fresh cuisine. Visitors walking along the streets of Chinatown will discover a plethora of mouthwatering options, including vendors selling steamed buns, and restaurants with dim sum and Sichuan cuisine. Chinatown is closest to JR Ishikawacho Station or Motomachi-Chinatown Station via the Minato Mirai Line. Yokohama Chinatown - 6 Things Not To Miss Out While Visiting! The Shin-Yokohama Ramen Museum offers ramen enthusiasts a great opportunity to learn about the history and development of one of Japan’s signature gourmet dishes. On the lower levels of the building, visitors can sample different ramen from the nine of Japan’s highly-regarded ramen restaurants. In addition, the inside of the museum features Showa period-style interior, creating a retro and nostalgic atmosphere. The museum can be accessed via JR Shin-Yokohama Station and Shin-Yokohama Station on the Yokohama Municipal Blue Line. Visitors coming to Yokohama Bashi Shotengai, a large traditional shopping arcade, can get a taste of the local shopping experience in Japan through sampling delicious street food, including karaage (Japanese fried chicken) and other Japanese home-style cooking offered at reasonable prices. It is also worth browsing the area for snacks, souvenirs, and goods. Yokohama Bashi Shotengai is located closest to Bandobashi Station on the Yokohama Municipal Station on the Blue Line. Minato Mirai is a popular destination in Yokohama well known for its unparalleled shopping. Shoppers can browse from hundreds of Japanese and international stores at a handful of large-scale shopping malls while enjoying the relaxed atmosphere created by the pleasant ocean breeze. The area is also very walkable, making this an pleasant destination for a day trip when it's sunn outside. Visitors can navigate around the area via the Akai Kutsu bus, or red shoes sightseeing bus. Exiting from Minato Mirai Station on Yokohama’s Minato Mirai line is the most convenient way to access this area. Landmark Tower is an iconic fixture of the Yokohama skyline and in Japan, reaching nearly 300 meters and claiming a spot as one of the tallest structures in the country. From the observatory on the 69th floor, visitors can enjoy beautiful views day and night of the surrounding areas in Yokohama, Kanagawa Prefecture, and beyond. Depending on the visibility, it is even possible to see Mt. Fuji. Connected to the tower is a 5-story shopping mall with Japanese and international brands, cafes, and fine dining options. Landmark Tower can be reached by a short walk from either JR Sakuragicho Station or Minato Mirai Station on the Minato Mirai Line. Enjoy A Wonderful Day At Yokohama Landmark Tower! Located in the Minato Mirai area, the Yokohama Red Brick Warehouse consists of two elegant warehouses once used for storage during the end of the Meiji era and into the Taisho era, converted into spaces for cultural events, commerce, and shopping since around 2000. The iconic red brick and unique architecture make this spot popular with visitors, and events are regularly held on the weekends around and in the warehouses. Both buildings contain shopping, but the second warehouse also contains dining options ranging from casual cafes to upscale restaurants. Yokohama Brick Warehouse is easiest accessible via the Akai kutsu bus from JR Sakuragicho Station. Picture from Let's Go To The World Famous Yokohama Anpanman Children's Museum! Anpanman is a popular children’s television show and comic that has been a prominent part of Japanese pop culture for decades. At the Yokohama Anpanman Children’s Museum, visitors can meet the characters in the world of Anpanman via interactive exhibits, classroom workshops, and performances. Anpanman-themed food and freshly-baked bread is also offered inside the museum facility. The museum is closest to Shin-Takashima Station on the Minato Mirai Line and Takashimacho Station on the Yokohama Municipal Subway Blue Line. Let's Go To The World Famous Yokohama Anpanman Children's Museum! Picture from Experience the Amazing Power of Nature at Orbi Yokohama! Orbi Yokohama is a museum that combines nature and technology with attractions that entertain and educate visitors about animals and the environment. A collaborative effort of SEGA and BBC Earth, there are several different types of attractions including a special 4D effect theater and a virtual aquarium that shows underwater wildlife in real size. Orbi Yokohama can be reached from Minato Mirai Station on the Minato Mirai Line or JR Sakuragicho Station. Experience the Amazing Power of Nature at Orbi Yokohama! The Hara Model Railway Museum is an impressive collection of model trains and model train accessories from around the world, started by a private curator who collected over 6,000 trains in his lifetime. The museum features these models as well as elaborate railway dioramas recreating cityscapes and towns, providing entertainment to both children and adults. To reach the museum, exit from either JR Yokohama Station or Shin-Takashima Station on the Minato Mirai Line. Held in to celebrate the Chinese Lunar New Year, this festival is a special multi-day event in and around Yokohama’s Chinatown. The area is decorated with beautiful ornamentation and events center around traditional Chinese performances, including dragon and Chinese lion dances. During the weekend of St. Patrick’s Day, the streets of Motomachi are painted in green as the holiday is celebrated with festivities and a well-attended parade. Events include live music and traditional folk dances that create a fun and festive atmosphere. Enjoy The 2018 St. Patrick's Day Parade In Yokohama! Bright yellow Pikachus fill Yokohama during August every year. This adorable parade has a different theme each year and various events help onlookers enjoy the stifling hot summer. See this unique event for yourself and capture some great photos. Oktoberfest and Oktoberfest-related events are regularly held in autumn in Yokohama at the Red Brick Warehouse. The length of festivities is around two-weeks, allowing visitors coming during the fall to get a taste of traditional food and fare from Germany. During November and December, the areas around Minato Mirai and Yokohama Station are lit up in the evening and night with elaborate, colorful winter illuminations of Christmas and seasonally-themed shapes and symbols. These illuminations are beautiful to see in-person and also photograph well, attracting a large number of visitors. Christmas At Yokohama's Landmark Tower: Dazzling Night View And Lights! Discover What Yokohama Has to Offer! Located by the sea, Yokohama is a city offering entertainment, scenery, and facilities that cannot be found in Tokyo, making this an ideal stop for a fulfilling and memorable trip to Japan. Come for a day trip or longer and take the time to explore Yokohama! 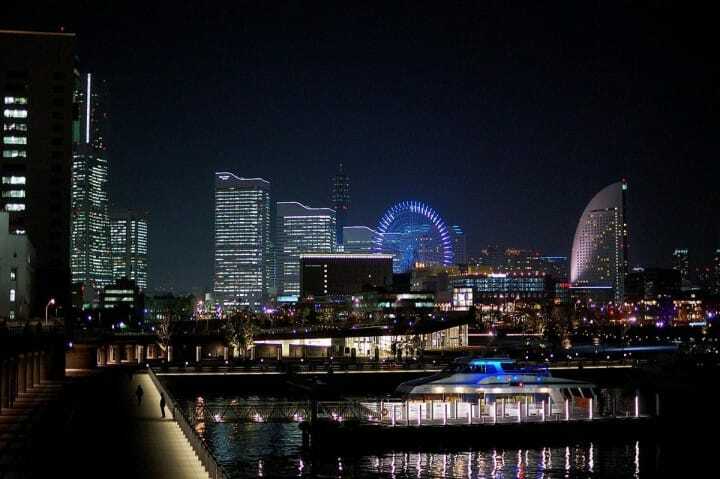 Yokohama - Make The Most Of A Day Spent In Minato Mirai!